In this year alone, my home brew mulled wine production stopped at the fifth batch. It’s the most I have made. Never have I anticipated to delve deep in brewing batch after batch for friends and family as a gift this year. The two gift options were either a Christmas Time Mulled Wine for those who fancy a deep, full-bodied, dry finish, or the Korean Pear Mulled Wine for a pure, tropical, lengthy finish. As you may have guessed it from my title, today’s recipe is an East meets West mulled wine. I am using a Sauvignon Blanc this time to brew with Korean pears. They are ginormous and unstoppable. Their size and succulence are comparable to their counterparts from China, the only disparity is that Korean pears are notably sweeter. China pears are thirst-quenchers yet without much taste to them. To start off, we need to make a healthy sugar base, using our key fruits, pressed juice and honey. Make sure you purchase proper quality raw honey, that has a deeper shade of yellow, not those cheap, golden looking liquid fake honey that contain syrups or other components to achieve the unique taste and texture of real honey. Read the label and origin of the honey before you purchase. Once this concentrated sugar base is formed over a rolling boil, pour in Port and Sauvignon Blanc, and the festive spices. Do not cover the pot fully, tilt the lid slightly so that some alcohol is boiled off. Leave it to simmer between 40 minutes to 1 hour until all the flesh are fully softened, and juices are released. I would highly recommend to leave out the pot overnight for it to sit, and strain the solids on the next day. Reheat in a microwave oven for 1 minute 30 seconds at 600W, and ladle into heat proof wine glasses to serve! 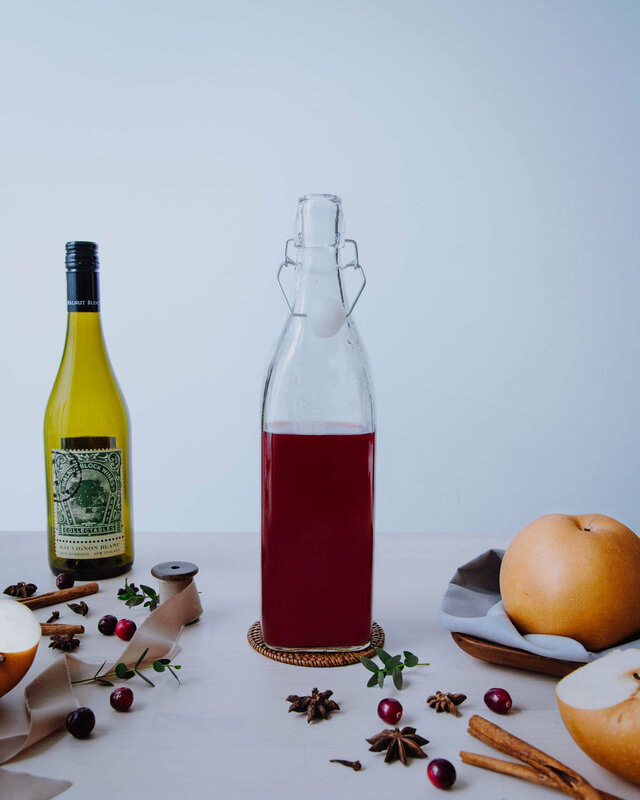 Beyond just a holiday drink, mulled wine is celebrated as a health drink with plentiful of health benefits you can read more in my previous post! So if you have any wines sitting around your house, get up and brew yourself or a dear friend of yours a bottle of warming, traditional mulled wine. Alternatively, you may check out a diverse range of ethically produced wines from TTG wines, and enjoy a 10% discount when you use the promo code “POUT10”. Just to clarify that it is not an affiliated code, and I do not earn a commission in your every purchase. Leave your comments down below if you have any questions prior to brewing your first mulled wine! Pour apple & ginger juice, pear, cranberries, honey in a medium-sized pot over medium high heat. Stir gently till honey has dissolved, bring it to rolling boil for 5 minutes (I’m using induction hob at heat mark 7). Turn heat to low (mark 5), pour Sauvignon Blanc, port, and all spices into the pot. Put the lid on partially, simmer for 40 minutes, till you hear all the cranberries “pop” and pear chunks softened. Remove from heat, let it cool for 5 minutes. Strain solids from the mulled wine, press them through the kitchen sieve for extra bit of mulled wine essence. Alternatively, leave the pot out with the lid on to cool overnight. Strain the solids. ladle them in mugs, and reheat in a microwave oven for 2 minutes to serve. Store the remaining in air tight glass bottles, refrigerate and store up to 3 days for a richer taste.